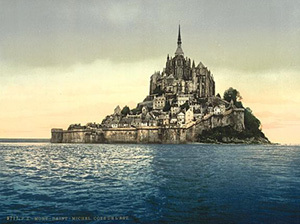 At the turn of the twentieth century the diplomat and scholar Henry Adams set out to explain to his fellow Americans what the massive island fortress monastery of Mont Saint Michel meant to its eleventh century Norman builders. To do this he turned to literature, history, theology, studies of migration patterns, warfare, and the economics of medieval manorial land holding. Like Adams, students in Washington and Lee’s Medieval and Renaissance Studies major approach European culture in an interdisciplinary way. They study the materials of many disciplines, examining them from different perspectives using diverse methods. Courses in traditional fields of study – like art history, religion, history, literature, musicology, philosophy, political theory, economics, and even astronomy – combine to form a comprehensive program whereby an entire culture can be encountered on a variety of levels. The program offers over sixty courses organized into four broad categories. Students concentrate their studies in one or two fields, but take courses in other areas as well, allowing them to receive a well-rounded and broadly-based understanding of a profoundly complex period. Many choose to do Honors in Medieval and Renaissance Studies, and many do part of their course work while studying abroad. Medieval and Renaissance Studies majors go on to careers in law, academics, medicine, teaching, museum curatorship, government service and business. For further information, visit the sites in “Student Resources” and contact the program director.